We decided to plan a long weekend camping trip to Writing on Stone Provincial Park over the Canada Day weekend at the beginning of July. 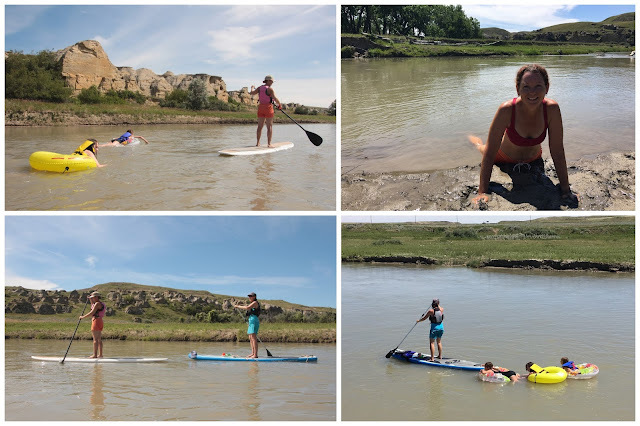 With a 3.5 to 4 hour drive from Calgary, it was an ideal destination for a three-night getaway, and we wanted to spend two days paddling on the Milk River. 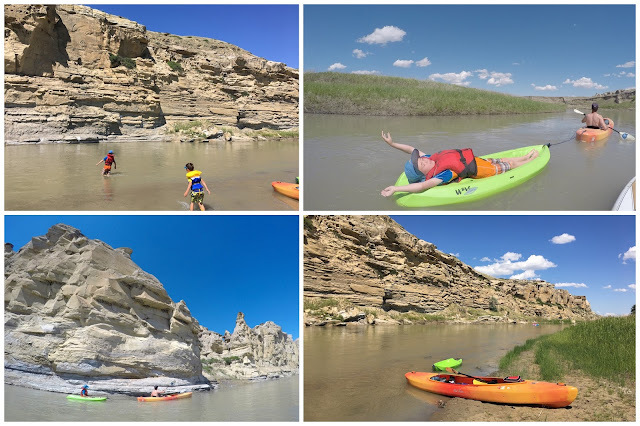 Our plans for the weekend included two days kayaking and stand up paddleboarding on the Milk River, lots of hiking through the hoodoos and badlands scenery, and a guided tour to see the first nations rock art that has made this park a national historic site. What we didn't know when we booked our trip was that it would be 30+ degrees Celsius the whole time we were at Writing on Stone, and that we'd pretty much spend our whole weekend IN the river. It was too hot to be on the river, to spend much time hiking through the badlands, or to take a walking tour. While we still tried to get out for some hikes, and we committed to the tour we'd booked, our favourite highlights were the hours we spent swimming in the river. We now know how awesome this campground is for those hot "summer scorchers," and the beach at Writing on Stone has become our new favourite beach in Alberta. We had swim noodles with us and spent a lot of time floating down the gentle river from one end of the beach to the other. The kids also loved the sand and mud at the beach. 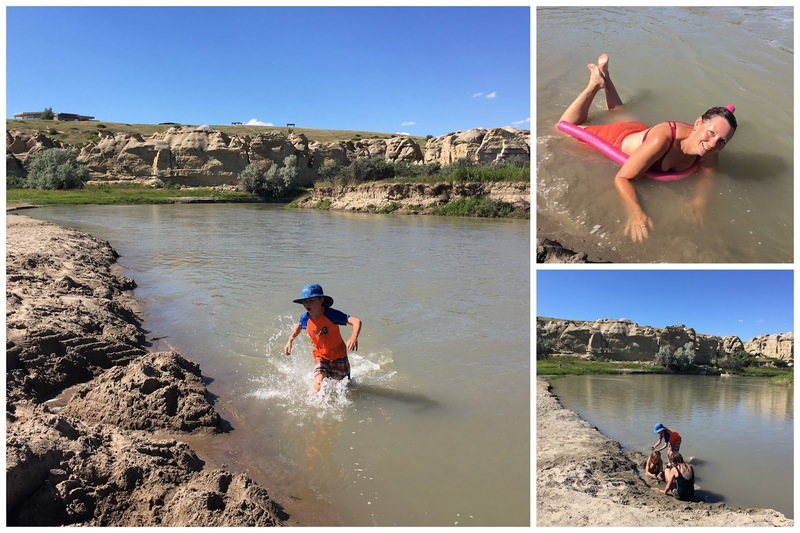 While it would have been fun to have been able to spend more time hiking, we loved swimming and floating down the Milk River, playing in the mud, and chilling at the beach. This is how summer camping trips become GREAT and we'll be back for sure! We spent two half-days leisurely floating down the Milk River through spectacular sandstone cliffs. We watched cliff sparrows flying out of their nests along the rivers, we stopped to swim and to play in the mud, and we tested just how many different kinds of vessels we could send down the river. In two days of paddling, we used a combination of stand up paddleboards, kayaks, canoes, and tubes. All worked well, but the tubes were definitely the slowest. Aim to have somebody towing kids in tubes if you want to go this route. This is a great river for kids learning to paddle! This was a short 8 km float and was well suited to novice paddlers. We had kids floating in tubes, one paddling his own sit on top kayak, and a mom navigating her first river on a stand up paddleboard. Nobody had any problems, and there were only a couple of "rough" sections where we passed over a few mild rapids/riffles. The tubes were fine and nobody tipped. This was a 10 km paddle according to maps in the campground and I can't really recommend doing this stretch in tubes. It's best done with an actual boat that you can steer. There were a few sweepers, one side channel you really wouldn't have wanted to go down by mistake, some rough sections with small rapids, and shallow patches with rocks. We did fine on stand up paddleboards but you couldn't just float blindly down the river. The kids also did fine in their own kayaks but a bit of experience paddling on a river would be recommended. Still, it was a great river trip for novice paddlers wanting to try some easy moving water. Both of our paddles took us roughly 3 to 4 hours because we stopped a lot. We also didn't hurry, and we floated a lot. When we weren't paddling down the river, we still enjoyed floating through camp in tubes. The camp store sells small tubes (or bring your own,) and you can jump in at the top of the campground by the playground. Float down to the beach in a leisurely 10 minute float, and then repeat. This could amuse kids ALL day long. We hiked two trails while camping at Writing on Stone and tried to make sure we were on the trails early in the morning or later in the evening to avoid some of the heat. The trail leads you to the Battle Scene viewpoint where you can see native rock art, protected behind a cage. To see more rock art, and to get closer to the petroglyphs and pictographs, you'll need to take a guided tour into the private reserve. This trail starts beside the campground store and takes you up to the visitor centre on a steep trail with plenty of opportunities for scrambling in the hoodoos. We like this trail because families can climb and scramble all over the cliffs, play in secret little coulees, and explore the rugged terrain. I do encourage caution though with young kids because the rock is slippery. My son has taken a couple of falls while here. This was the third hike that we took, and this one allowed us to go inside the private reserve. I'll be honest and say that we preferred our guided tour in Dinosaur Provincial Park, finding it to be more interesting for children. The rock art tour seemed to appeal to adults with an interest in history and ancient culture. A friend took the tour and enjoyed it with her children, but they were the only people signed up for their tour, allowing the guide to move at a faster pace. Our tour group was larger and we stopped for at least 10 - 15 minutes at each wall to discuss the rock art, a pace that was too slow for the kids in our group. I am happy that we got to see some of the ancient petroglyphs and pictographs though, and did find that we got a deeper appreciation for this fascinating park and it's rick history. Want to Visit Writing on Stone Provincial Park with your Family? Visit the Alberta Parks website for more information on camping, hiking, and exploring in Writing on Stone Provincial Park. You can also read my previous story from our last visit a few years ago: Camping in Writing on Stone Provincial Park. Reservations for camping can be made on line. Guided Tours can also be booked on line. Finally, the campground also offers comfort camping if you'd rather camp in a canvas wall tent. Comfort campsites can be booked on the reservation site along with regular campsites. There are also two group sites here if you'd like to camp with a group of 5+ families. Disclaimer: I am an Alberta Parks Ambassador and receive free camping and guided tours. As always, all opinions are my own.